Aberth yn Rhuddlan…ond i pwy a pam? Un o’r pethau sydd wedi dod yn amlwg yn ystod fy ngwaith ymchwil ac ysgrifennu y blog yma ydi cynlleied o bobl sy’n siarad Cymraeg – neu yn hytrach – yn defnyddio cyfryngau cymdeithasol trwy gyfrwng y Gymraeg – sydd yn dilyn a blog. Felly, rhaid codi ymwybyddiaeth o’r gwaith dwi’n gwneud ar eich archaeoleg, hanes a llenyddiaeth chi. Mae’n unarddeg mlynedd rwan ers i mi gychwyn fel yr ymchwilydd ac archaeolegydd ar gyfres ‘Tywysogion’. Fel rhan o’r gwaith, roedd rhaid ymweld a nifer o amgueddfeydd, a chwilota am straeon yn y creiriau i fod yn rhan o’r gyfres. Un o’r straeon na orfenodd i fynu yn y gyfres orfennedig yw hanes ceubwll T349. Nodwch mae cestyll a trefi – nid castell a tref – yw’r geiriau cywir. Roedd y cloddio yn safle ‘T’ yn edrych ar beth digwyddodd i ffos yr hen dref Normanaidd wrth i’r castell a dref newydd cael ei godi. Roedd ceubwll T349 wedi ei dori i fewn i dop y ffos wedi iddo gael ei ail-lenwi. Rhaid dyfynnu adroddiad yr archaeolegydd yn y man yma. Pit T349 (Site T) deserves special comment. It appeared to have been dug through the final infill of Ditch III, ascribed above to the summer of 1277. The collection of objects it contained is remarkable. The barrel padlock No 86, with a possible date range within the 11th and 12th centuries, was found with bucket handle No 75 and chain No 80 and the finely worked, unused whetstone MSF 32 above a layer of lead which had been poured into the pit around some wooden object. If the collection were prehistoric it would undoubtedly be labelled ritual. Even around 1277 its deposition suggests some deliberate act connected with changes in control and perhaps the moving of castle and borough sites. Felly, pa fath o hud a lledrith sydd yn digwydd yma? Mae darganfod esiampl o digwyddiadau fel hyn yn anarferol iawn. Fel arfer, gwelir hud a lledrith yn rhan o’r brocess o gladdu unigolyn, a mae nifer helaeth o cyrff wedi dod i’r amlwg yn dangos fod rhywbeth ‘ychwanegol’ i’r arferol wedi cael ei cynnwys wrth rhoi y person yn y bedd. Tybed be a welir yma ydi claddu cymuned Cymraeg gan y Cymru wrth i’r castell newydd godi. Yn diddorol, a rhywbeth na godwyd yn y adroddiad gwreiddiol, pwy rhoddodd caniatad i’r digwyddaid yma? 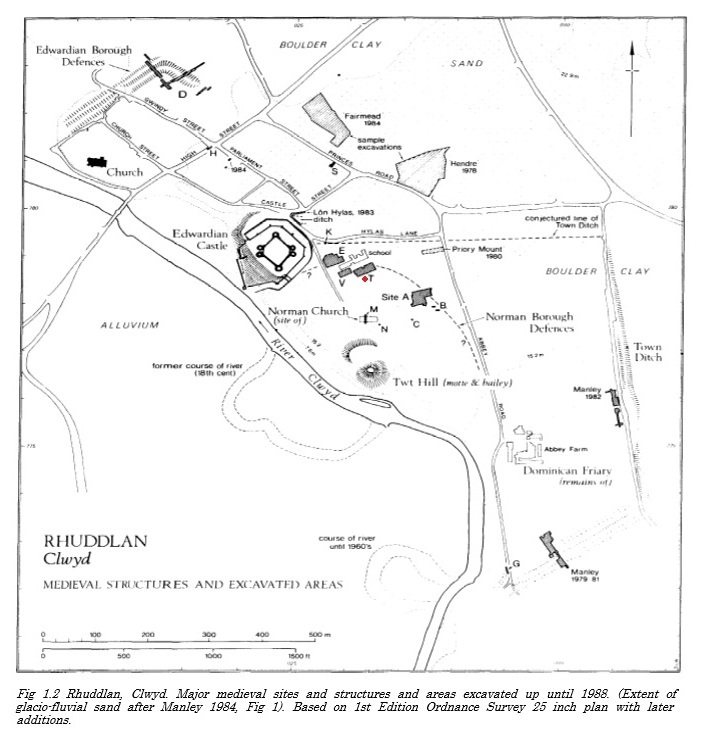 I toddi y Plwm rhaid cael tan boeth, a rhaid hefyd casglu y creiriau yma at ei gilydd, rhai mae’r archaeolegydd yn meddwl oedd yn hen ac wedi cael ei cadw. Pwy cerfiodd y gwrthrych pren, a beth yn union oedd hi? Yn olaf, faint o bobl oedd yn rhan o’r serimoni arbennig yma, a pwy oeddyn nhw? Fel dwi wedi darganfod yn ystod y gwaith yma, nid hwn yw’r unig esiampl o hud a lledrith yn cael ei ddefnyddio yn ystod yr oesoedd canol. will provide you with some context of why I was asked to show this group around. Sycharth (if you’ve either read the above blog posts or know already) was burnt down in the early part of the fifteenth century by Prince Hal – later King Henry V – and his men. 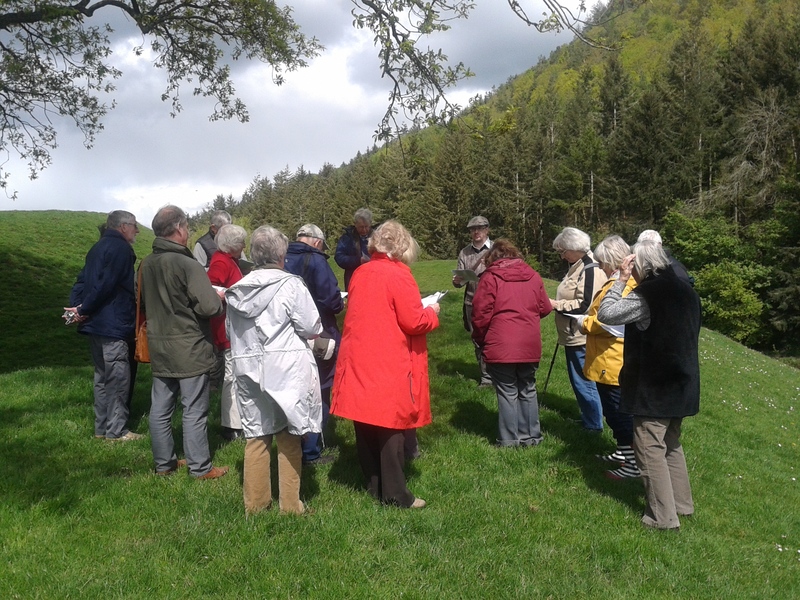 With no house to visit – the group wanted to see how the poem which described the site compared to the archaeology excavated in the 1962-63 and 2003 and the geophysical survey undertaken in 1997 and 2009. Members of DOWH walking up to the site of Sycharth. 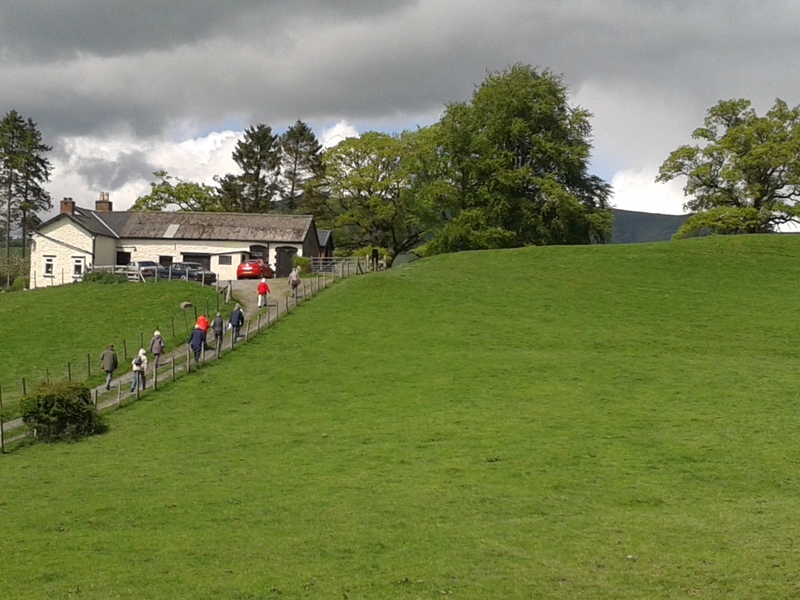 The ditch around the garden is visible to the right of the central group of walkers. The work of DOWH since their inception in 2004 as the Snowdonia Dendrochronology Project has now funded over 100 denrochronological dates. Go to http://www.scribd.com/doc/53735685/Dendrochronology if you want to know more about this scientific technique. Standing at the entrance to the llys at Sycharth and explaining how the poem describes the both the llys and the landscape around it. On Saturday I was in Aberystwyth giving a version of a blog post which was published on the ‘Beyond Borders’ website in August 2013. http://beyondborders-medievalblog.blogspot.co.uk/2013/08/love-like-hare-monuments-and.html This was at the Canolfan Uwchefrydiau Cymreig a Cheltaidd / Centre for Advanced Welsh and Celtic Studies http://www.wales.ac.uk/en/CentreforAdvancedWelshCelticStudies/IntroductiontotheCentre.aspx for their Fforwm Beirdd yr Uchelwyr / Poets of the Nobility Forum. The Centre brought together five researchers who are all looking at different aspects of the Poets and their poetry. As the only archaeologist there it was interesting to see literature specialists would take to my research, and I’m pleased that I had such a positive response to my research and how I am using the poetry to inform my archaeological and historical research. 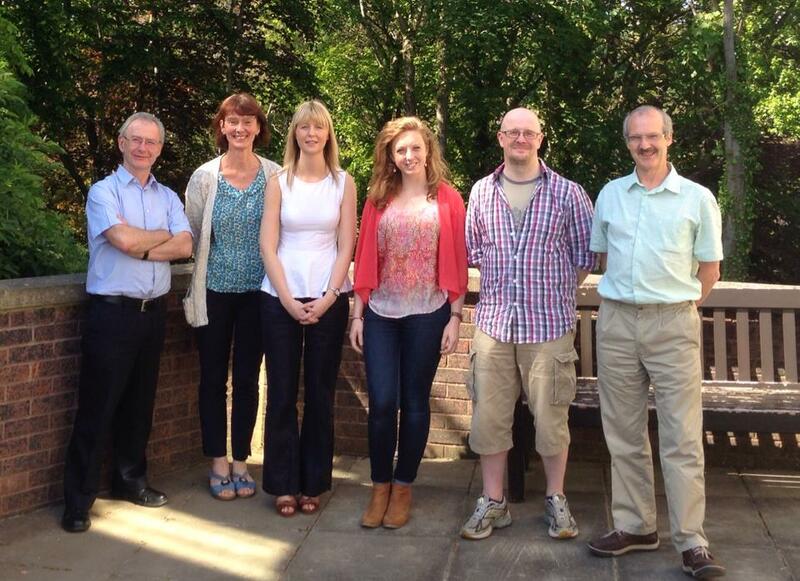 Left to Right: Professor Dafydd Johnston, Dr Ann Parry Owen, Dr Lowri Haf Morgans, Hanna Hopwood, Spencer Gavin Smith, Dr Cynfael Lake. 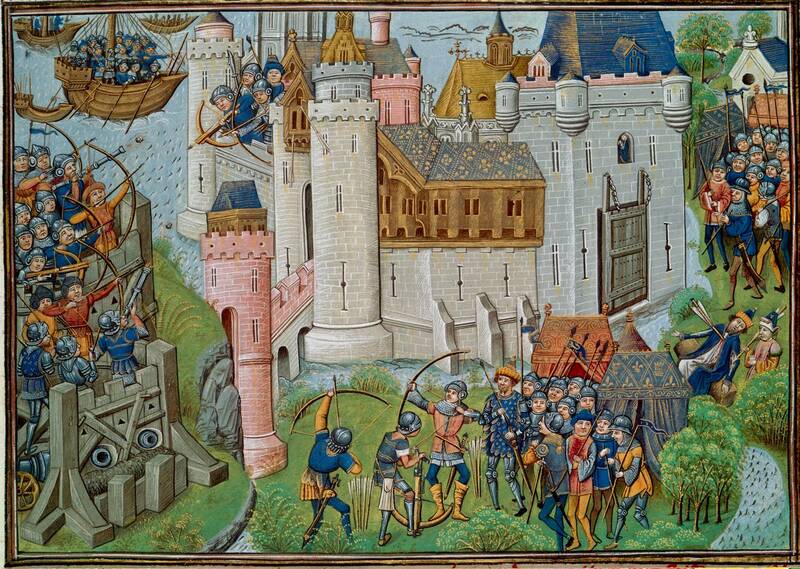 In 1378 a Mercenary Captain fighting in the Hundred Years War was assassinated. His name was Owain ap Thomas, and he was a Welshman fighting for the French against the English, and his assassination was ordered by the English Crown. [Owain is on the right falling backwards – his assassin, John Lamb, is behind him]. This might sound a sub-plot from ‘Game of Thrones’, but this was all very real and had repercussions which we are only just really beginning to understand in terms of the history, archaeology, literature and art history of this particular man. Owain ap Thomas was also known as Owain Lawgoch or Yvain de Galles. His career as a mercenary captain in France, Switzerland and Guernsey, lasted from what the documentary sources can tell us from 1363 to 1378. He was buried in the nearby chapel dedicated to St.Leger, and his mercenary company continued on, fighting for the French Crown without him. The story of Owain ap Thomas was written about by in A.D. Carr (1991). 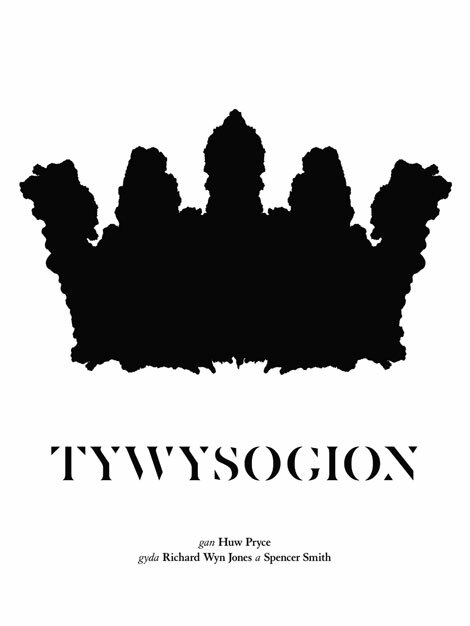 Owen of Wales: The End of the House of Gwynedd. University of Wales Press. ISBN 0-7083-1064-8. Copies are hard to find, but if you are interested in the period you should try and find a copy. 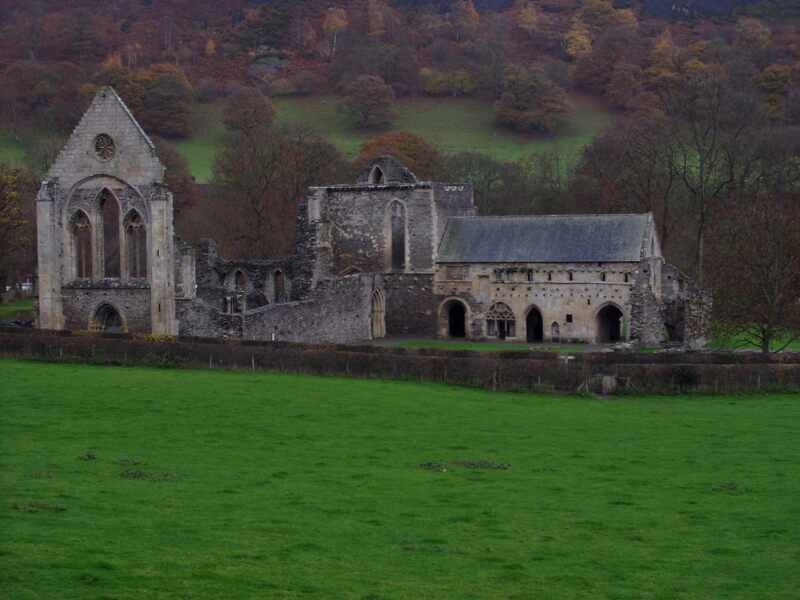 The book identified the manors (consisting of a manor house and associated land) which Owain left behind when he went to France, and these were in Powys, Gloucestershire, Cheshire and Surrey. Inquisitions were held by the authorities in each of these places to find out when he had left and what property and possessions he had left behind. The manor in Surrey was at Tatsfield (Latitude 51.287393; Longitude 0.029869080) and had been in Owain’s family for three generations. His grandfather Rhodri ap Gruffudd (brother of Llywelyn ap Gruffudd who had been Prince of Gwynedd until his death in 1282) had come into possession of the manor in about 1310, and it belonged to his son Thomas from 1315 to 1363. I’ve been researching the archaeological evidence for the estates of Owain Lawgoch since 2004, and a paper on them was included in a book published in 2008 entitled ‘Mercenaries and Paid Men: The Mercenary Identity in the Middle Ages’. You can download a copy of the paper from http://works.bepress.com/spencer_gavin_smith/ The history of Tatsfield in the years after 1363 is for me, particularly fascinating. The manor itself ceased to exist as an administrative entity after Owain left, and it was handed over to the lords of the adjoining manor of Titsey (Latitude 51.278615; Longitude 0.014226437). They constructed a court house in Tatsfield to deal with the administration of the cases that happened there, but they continued only to live in Titsey. 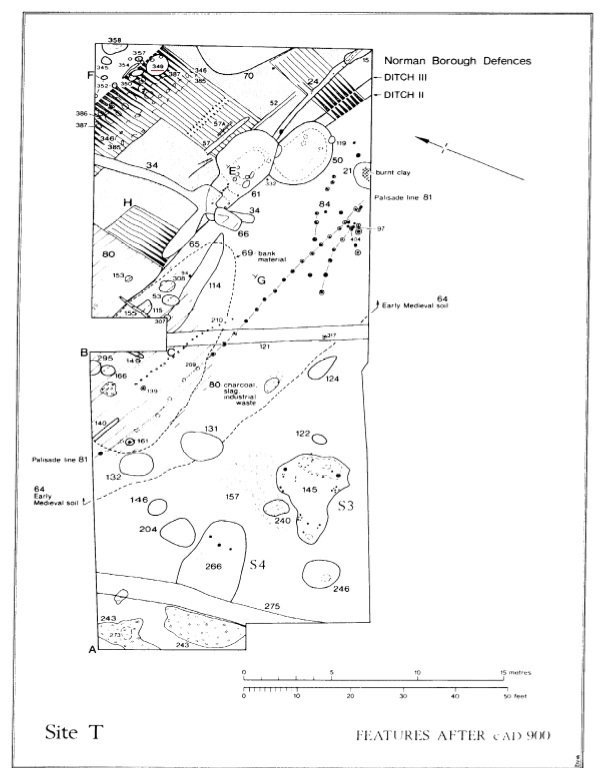 I directed an excavation in Tatsfield in 2004, and the evidence from this and from the historical evidence I’ve also been able to research, suggests that the Manor House there was dealt with in the same way the Llysoedd were removed during the Edwardian Conquest (see https://medievalparksgardensanddesignedlandscapes.wordpress.com/2014/05/04/avengers-assemble-but-where/). The paucity of building materials left on the site suggested careful dismantling rather than simply pushing the building over and rendering it unusable. Doing this would leave a visible marker and a place where assembly could happen, and the proximity to London – only 20 miles to Westminster – would have been an even more potent and visible reminder than a series of castles along the north Wales coast. A very powerful word. 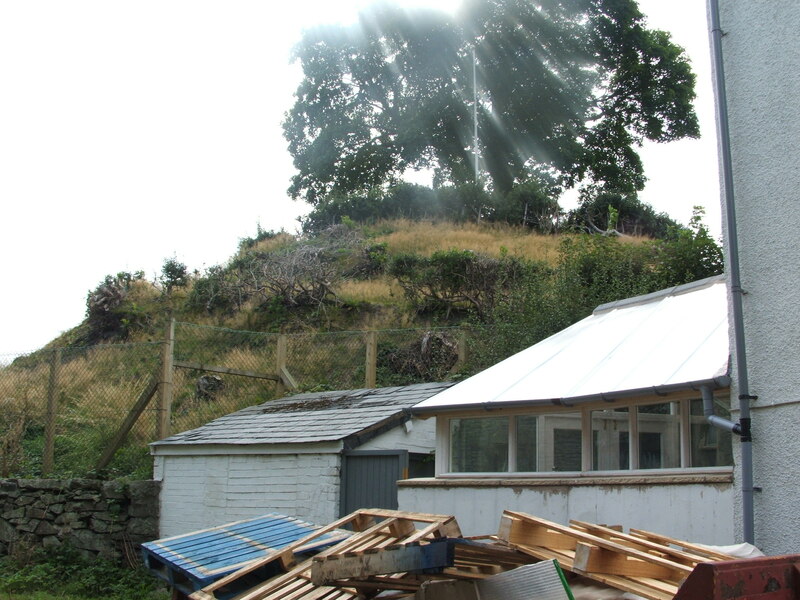 It tends to be used to describe the removal of an item from the landscape – and conflict – where ever it may happen, can provide examples of something that was there at one moment only to have ceased to exist in a recognisable form the next. If you visit a medieval site today, with manicured lawns and helpful guidebook, the most obvious thing to notice is that there is actually something left to visit. Even with a tumultuous event like the Dissolution of the Monasteries, where the communities were removed and buildings stripped of useful materials, much of the fabric can have survived the 500 or so years since the event, albeit with piles of fallen masonry removed and a gift shop for all the essential purchases. 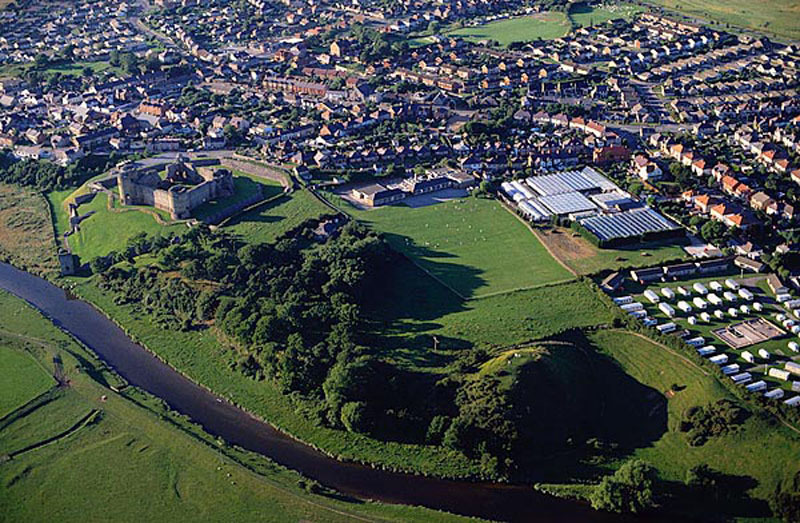 Sites composed of earthworks, for example motte and bailey castles, can appear at first glance even more ephemeral. Understanding how each individual lump and bump relates to another does take practice, but an understanding of the typology of different monument types means that even these can be interpreted as the visitor walks around the site. Some sites however, defy simple interpretation if they have been ‘removed’ from the landscape because of their social, political or cultural importance. 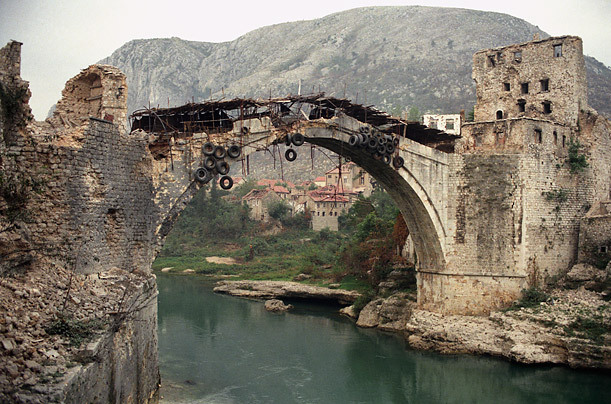 During the Croat-Bosnian war in 1993, the 16th century Stari Most bridge over the river Neretva in the City of Mostar, Bosnia (Latitude 43.205425; Longitude 17.483822) was destroyed by Croat forces. Stari Most bridge over the river Neretva in the City of Mostar, Bosnia (Latitude 43.205425; Longitude 17.483822) prior to completion of the destruction process. Here then, we see that cultural pressure can be brought to bear both to destroy and replace an important monument, but what happens when only the first part of the process is carried out? During the Edwardian Conquest of Wales, part of Edward I’s strategy was to construct a series of castles at strategic points around the North Wales coast. As well as providing places where soldiers could be based in order to react to any Welsh threat, perceived or otherwise, these castles replaced the pre-existing system of llysoedd which served as the administrative centres for the Welsh Princes. The main hall of the llys complex was an important meeting point, and as such Edward had each of them removed, either taking them down and recycling their component parts into other buildings or moving them to be reconstructed within one of the new castles. 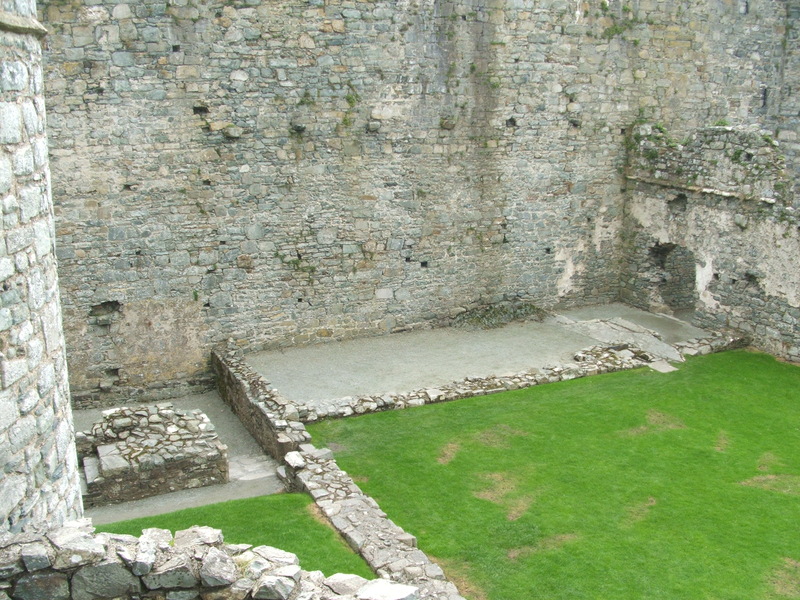 Ystumgwern Hall, reconstructed within Harlech Castle (Latitude 52.859926; Longitude -4.1092917). Originally from the Llys at Ystumgwern – location not known but general centre of Ystumgwern (Latitude 52.795159; Longitude -4.1002822). The removal of the hall from the llys complex at Ystumgwern meant that the location was subsequently lost to future generations who might have used the halls as a meeting point at which to assemble and plan a revolt against their new rulers. As archaeologists we can apply a suite of techniques to search for the llys complex and find out more about why these locations were so important, but we cannot replace these buildings in the landscape in the same way the Stari Most bridge has been replaced. Next week’s blog post will examine the fate of a llys complex and its inhabitants with a very particular story to tell. Again, thank you for your support through http://www.gofundme.com/medievalgardensandparks – the last fortnight brought another £25 in donations towards my PhD course fees.